Blog | Chics Take Flight! 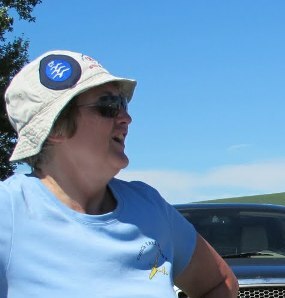 Carol is a valuable member of the Chics organizing committee, and is a flight instructor at Central Alberta Gliding Club. You’ll meet her this year at the flight line. I have always been interested in airplanes, and when I was younger I wanted to be an aeronautical engineer. I started out university in aeronautical engineering, but eventually graduated in materials engineering. I still had a love for airplanes, and eventually got a job as a Structures Engineer for Canadian Airlines in Vancouver. I worked for Canadian Airlines and then Air Canada for a total of 6 years. During that time I met my future husband (a glider instructor) and learned to fly gliders. 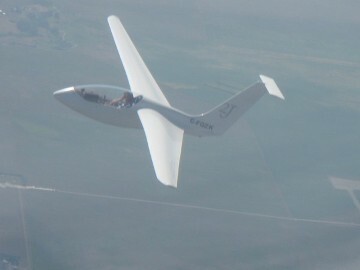 I took several years off from “professional” aviation to have 2 children, but still continued on with the glider flying. I have been working for the last two and half years as a Methods Engineer at Viking Air in Calgary. Viking Air owns the type certificate for the Twin Otter, and we have put the Twin Otter back into production. I had always been interested in aircraft and soaring. When younger, I wanted to be an Air Cadet to have the opportunity to fly in a glider, however there were only Army Cadets in the town where I grew up. (I am a proud supporter of the Cadet program and learned many skills as an Army Cadet) When I met my future husband, who was a glider instructor, I absolutely wanted to get out and try it as soon as possible. 3. Tell us about a memorable flight. My most memorable flight was a cross-country flight I attempted in 2009. I was attempting to fly a 300km triangle for an internationally recognized soaring badge. The day was challenging and several times I considered abandoning the task I had declared. I persevered and finally got to the point where I thought I was going to make it. The day had been long, and in soaring, the conditions die out as the sun gets lower. I eventually landed my glider only 4km short of the field, so did not complete the task. That flight lasted six hours and forty-two minutes and although I did not reach my goal, I learned a lot about soaring that day. My scariest moment was soaring in Southern Alberta and landing my glider up the side of a hill in an off-field landing. I hadn’t realized how steep the terrain was in the area. I now pay a lot more attention to the area beneath me and try not to put myself in a situation where I need to be lucky to have it work out. Aviation has traditionally been male dominated. Most women aren’t interested in mechanical/how-it-works types of things. The beauty of soaring is that you don’t need to know a lot of mechanical parts and pieces. It has been called “aerial ballet” because the gliders dance around the sky, rather than defeat it with noise and fuel. I started flying gliders in 2000, and earned my glider pilot license in 2001. I earned my glider flight instructor rating in 2008. I have participated in several Provincial/Western Contests and flew in the Canadian National Soaring Contest in 2009. When flying within 1000′ of the ground, you need to have a plan and execute your plan correctly. The landing is the most critical part of the flight and it absolutely cannot depend on luck or hope. Learning to fly a circuit correctly is the most important skill you learn as a pilot. Not to give away as a door prize though (although that would have been amazing). MGM Ford in Red Deer has donated use of a van for the day, to ferry you from the Registration area to the flight line. This will come in super handy if the wind shifts and we have to use the far end of the runway! So thanks to MGM Ford for making sure we can access our airplanes in comfort! We’re going to be handing out swag and giving away really cool door prizes all day, like spa-themed gift baskets, clothing, shoulder bags, and even some passes to local attractions. Whoa! Our sponsors sure are generous! WHAT IS YOUR FLYING BACKGROUND? I have always had an interest in flying. Several years ago I finally had the opportunity to realize my dream of flight and I found that I enjoyed gliding in sailplanes. 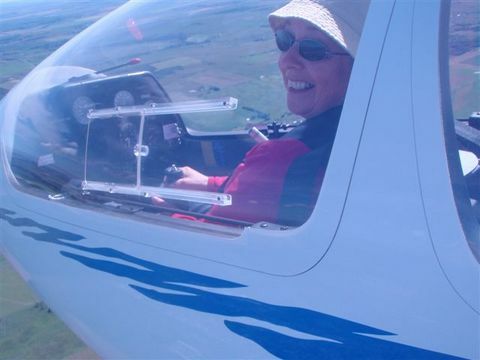 Now I am a licensed glider pilot, President of the Central Alberta Gliding Club, and a member of several aviation organizations such as: the Soaring Association of Canada, Women in Aviation International – Calgary, and the Women Soaring Pilots Association. I am also on the planning committee for Chics Take Flight, a women’s flying event organized for August 10th, 2013 at Innisfail Airport that is open to the public and for everyone to attend. WHAT MADE YOU GET INTO SOARING? The event that captured my heart took place in the late fall of 2007 near Pincher Creek at the Cowley Fall Wave Camp when I was invited to ride as a passenger in one of the gliders. The pilot took me on a spectacular flight that lasted 3 and 1/2 hours. The soaring conditions enabled the glider to ascend to an altitude over 18,500 feet. The view of the Rocky Mountains was breath-taking. The only sounds were that of the air flowing over the wings and the rhythmic sound of the pulsating oxygen system. We soared between the clouds as they were visibly forming near us. The sun was shining casting shadows on the clouds below, creating rainbows and halos. We flew as far south as we were legally allowed to go to just north of the Canada/US border, then headed north 150 km, soaring above Waterton National Park, alongside the Livingstone Range catching the ‘wave’ activity all the way to the south end of Chain Lakes Provincial Park. When the soaring conditions became weak the glider descended low several times, which meant we had to prepare for a potential outfield landing. I trusted in the skills of the pilot in being able to read the conditions and find lift where there no visible signs. When we arrived back to the Cowley airfield, we were cold and tired. The joy of that flight will last my life time. HOW MANY WOMEN ARE INVOLVED IN AVIATION IN CANADA? According to an article in the January / February 2012 issue of Canadian Aviator entitled “Welcoming More Women to Aviation” there are 3,970 women in Canada who hold some type of pilot licence. That is one in 4000 women where for men it is 1 in 270. Another statistic I recently heard quoted is that approximately 6% of the female population is involved in aviation one way or another. WHY SHOULD MORE WOMEN FLY? We are equally as capable as men. There is no valid reason why we shouldn’t. WHY DO YOU THINK THERE AREN’T MORE? Traditionally the majority of women stay in the home to raise their families. Some do not have the expendable income to take the training to enjoy it as a sport. When those circumstances change many women look elsewhere for fulfillment. Some are not aware that so many aviation career options are available. Soaring is a great choice because of the support you receive from other members of the soaring community. HOW INVITING WAS THE CLUB ENVIRONMENT TOWARDS YOURSELF AND TOWARDS OTHER WOMEN? Aviation enthusiasts, of any kind, share a similar passion and easily become friends, the camaraderie is phenomenal. I had already been coming out to the Central Alberta Gliding Club for several years so most people already knew me. I was welcomed and encouraged by all. When I joined the club in 2008 it already had several female members, but they came and went as their life happened and priorities changed. One female member is a flight instructor. I considered it a privilege that I was able to train under her guidance; she is still my mentor. WHY DID HAVING A FEMALE INSTRUCTOR MAKE A DIFFERENCE? It’s known that men and women have different learning capabilities. Although the Soaring Association of Canada Flight Instructor Course is standardized, the delivery of the information is what makes the difference. Diverse styles of learning and teaching mean that some instructors will fit you better than others. She had gone through the same training and could easily relate to the problems I experienced. I have also had some awesome male instructors. HOW LONG DID IT TAKE YOU TO GET YOUR PILOT’S LICENCE? I trained on weekends and holidays during the short soaring season for two years. In August of 2010 I wrote the Transport Canada Glider Pilot Exam then received my Glider Pilot License shortly after that. Most people are able to complete their training in 50 to 100 flights, some even sooner. The flight instructors in most Canadian clubs volunteer their time to teach you the necessary skills and decision making processes. Club training gliders contain two seats, one for the instructor in the back and one for the student in the front. They are built tough and can withstand the effects of training flights. After you have proven your skills the instructors will sign you off to go on solo flights. From there it is only the beginning. You can go as far as you want to. Experienced pilots participate in events and contests held worldwide. Flights can last over 12 hours and gliders can travel over 1500 km in the right conditions. DO YOU EVER GET SCARED WHILE FLYING? My scariest moment was on my very first training flight when the instructor let me have control of the glider for the first time for take-off. With my limited experience the glider seemed to be veering over to the side of the runway and I could not correct it fast enough for my comfort level so I quickly let the instructor take control. In hindsight it was only a minor deviation. Since then I have taken many flights where I have had to extend my personal comfort level in order to succeed. But that is part of soaring. You can compare it to the first time you drove a vehicle. You were nervous and probably made some minor mistakes but with training and practice your skills improved and eventually you received your drivers license. Same applies to gliding. The biggest difference is that there are far fewer planes in the skies than there are vehicles on the road. Chics Take Flight is a special, one-day event being held on Saturday August 10th, where women can explore what soaring has to offer as a hobby and may discover potential aviation careers. It has been organized by ladies from three Alberta gliding clubs, with the support of those clubs and the Alberta Soaring Council. The Central Alberta Gliding Club is hosting the 2nd annual Chics Take Flight event. The club is located 8 kilometers northwest of Innisfail on highway 54. Just look for the posted signs. Whether you’re already a pilot, an aviation fan, curious about sailplanes, or simply wish to try something new and exciting, there is something for you at Chics Take Flight. 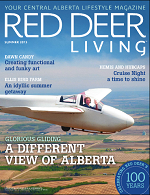 Check out the spectacular photography in the latest issue of Red Deer Living! The article has more beautiful pictures both in the air and on the ground, as well as Val’s very eloquent description of soaring. You can learn more about Val soon, as I’ll be starting a series of “get to know the Chics staff” blog posts this month.